If a Kungfu practitioner doesn’t know regimen, he won’t get high Kungfu level even trains Kungfu everyday. On the contrary, probablly will get sick. There was saying from predecessor: warmness promoted your Kungfu , coldness results in illness. It’s normal that body get sweat and hot After the training, but Avoid coldness and keep warm after training, which is the first thing need to be done for Kungfu practitioner. For people who do specific Kungfu training, such as iron palm, iron body, can’t touch cold water, stone and iron pipe within an hour, if not, his Kungfu will fade out and get sick. Do not practice Kung Fu in fog. The dirt and toxin in fog will bring harms to the human. For this kind of weather, you can drink three small cups of alcohol to detoxify. One cup could work, but three cups are better (For someone who never drink, do not push yourself). There is old saying for Kungfu practitioner, guard against wind is as important as against arrow. Some of rheumatism diseases are caused by wind, therefore,do not stand in wind or use electric fan when you are sweat. Kungfu practitioner should know “Guard sweat”. You can wipe sweat with dry towel, but not with electric fan or take a cold shower. The sweat pore on skin will open when you get hot, and also will close when get in coldness suddenly. At this time, the toxin in your body won’t get out by sweat, but will stay in body, then you will get sick if keep like this for a period of time. The right way should be: If it is winter, put on your jacket to keep warm even you get sweat. Just let body keep sweating and dry naturally. After that, you can take a hot shower. If it’s summer, don’t need to put on your jacket, but still have to let sweat go and let it dry naturally. This is what we talked “Guard sweat”. Water is the main element in body. But you might get sick If supplement a lot of water as soon as you get sweat, The right way should be: take a cup of cold boiled water before morning training in order to make up the water you lost in the night. And also drink some warm water before the night training. It’s not right time to supplement water when you get sweat, should be when your sweat get dried. And also not too much, half a cup or a cup is ok. Tapping some specific acupoint is very helpful to get relax after training. One is to tap the double jian jing acupoint (in the center of each side of the shoulder),36 times for each side. The second is to tap the zu san li acupoint (first, find the point 10 centimeters from the knee on the shin,Second, Zuo san li acupoint is around 3 centimeters away from the first point outside of shin),36 times as well. The third way is to tap the yong quan acupoint ( in the center of the bottom of the feet), also 36 times for each foot. These three tapping, can not only get body relax, but also get longevity. One purpose of training Kungfu is to get longevity by guarding kidney and promoting Yang. There are different way to guard kidney and promote Yang, the most simple two ways we commen used are below: one is foot bath. Give your feet bath after training or before sleep, then stroke the yongquan acupoint(center of your foot) 36 times for each foot. The second is to rub the shen shu acupoint( around 3 centimeters away from the second section of your lumbar).Face to south,step as wide as shoulder, keep body relax, get finger together, stroke shen yu acupoint with the back of your palm, slide down slowly.81 times for each side,up and down is one time. There is always toxin from food, air and medicine going to body and accumulate in body. 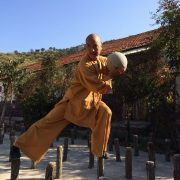 As Kungfu practitioner, should know how to clean the body and keep healthy by kungfu. There are methods as follows: after the training, sit down by facing to the south. Relax the whole body, calm down mind, cross the legs(left leg outside, right leg inside). Palm downward on the knee, eyes a little bit close, tongue touch the upper plate , breathe naturally, empty your mind. Do meditation in this way ten to thirty minutes. After meditation, open eyes, straighten the legs, imagine the toxin is going out from Yongquan acupoint(the center of the feet). Mind focus on the yong quan acupoint 5 to 10 minutes. At the end, rub face up and down with palm(like washing face) or tap the whole body, and finish slowly.